I’m a tremendous fan of the digital marketing career path. Those of us who work hard in digital marketing are able to build truly exciting and rewarding careers. I’m also a tremendous fan of giving back. When you have built a rewarding career, you’re in the driver’s seat to give back. Nicole and I recently participated in (and donated money to) the 20th Annual Lupus 5k, for example. Today, I wanted to highlight a company that has truly gone above-and-beyond, Acquisio. Each year, my good friend Marc Poirier, Co-Founder and EVP of Business Development, participates in the Make-A-Wish Foundation 48-Hour Ride. This year, Marc personally raised $10,945. In total, Acquisio raised $37,702. Simply amazing! I wanted to take a moment to congratulate Marc and the entire Acquisio team. They are true leaders in our industry from a technology standpoint, and also a generosity standpoint. Their hard work will truly make a difference for the kids. Do you have any team charity events planned? No matter how big or small, no matter whether you are donating money or your time, every little bit counts! And, it’s a great vehicle for team building! 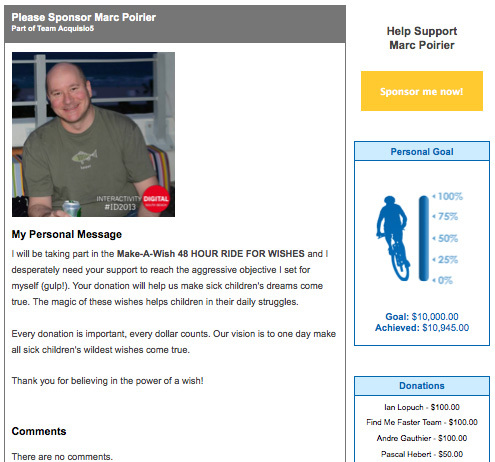 If you’d like to contribute to Marc Poirier’s Make-A-Wish campaign, you can still do so! I was actually a little bit late this time, and my donation went through just fine. Please consider donating to Make-A-Wish, make a difference in a kid’s life today! What you see above are gifts that Nicole and I donated to the Family Giving Tree. My amazing employer sponsored a huge Family Giving Tree drive and we took this opportunity to select three gift packages for in-need children. How does Family Giving Tree work? They are really amazing… They find families and individuals who cannot afford gifts this holiday season. They determine the gift wishes of those in-need and then share those gift wishes with elfs. Nicole and I decided to buy gifts for three children this holiday season. 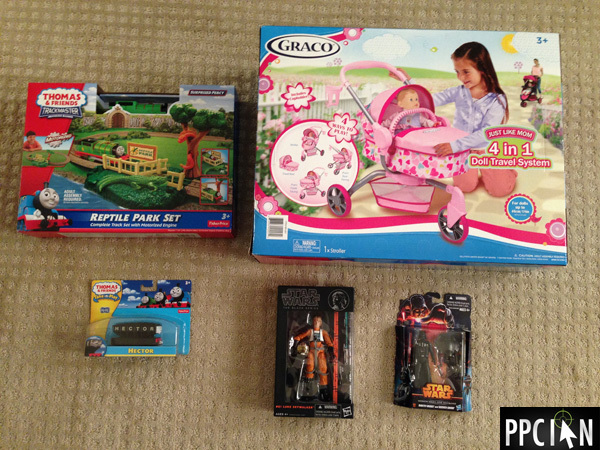 We purchased Star Wars action figures, a Thomas & Friends train set with extra train, and a doll stroller system. We had so much fun shopping for the children, and know that these gifts will bring joy to three special children today! Overall, 2013 was a record year for us in terms of charity/donations (and was one of my major goals going into the year). Those of us in the digital marketing space are so incredibly fortunate. Take a moment to reflect and help others. Do everything you can throughout the day to help your team, co-workers, partners, and really anyone you interact with. Outside of work (or as a work/team activity), donate your time to those less fortunate. Outside of work (or again as a work/team activity) find ways to donate money and gifts. This truly is the season of giving. It’s time to give back and help others in need. As an industry, we can make a truly positive impact on this world, not only through our work but through our kindness and spirit of giving! I’m a huge fan of giving back and charity. In fact, giving back is one of my top 2013 goals. 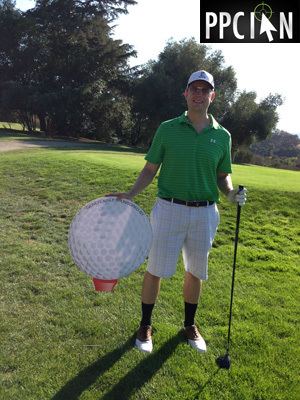 Recently, I had the honor of playing golf in the 9th annual Gatepath Golf Classic at the Stanford Golf course. You can see a picture below, it was an amazing round of golf and a true honor. I enjoyed golfing with co-workers, donating money to Community Gatepath (they had mulligans for purchase, a special “Vegas” hole, and a raffle), and overall supporting an amazing cause. Community Gatepath is all about turning disabilities into possibilities. The provide support and education to both children and adults with disabilities, helping them learn and grow. Community Gatepath opens up doors and opportunities, and is such an amazing cause to support. I’m truly fortunate to work at a company that supports and values charity events like this one. I’m all about living and working in a values-driven environment. I find that the more you give, the more you receive. A fun story… Just about a year ago, I had the honor of playing in several other charity golf tournaments. At most of these events, they have a fun raffle with the goal of donating money to the charity being represented. I always try to participate in the raffles and donate as a fun way to give back. At the Friends For Youth tournament about a year ago, I won a one night stay at the wonderful Garden Court Hotel in downtown Palo Alto. Nicole and I have been so busy over the past year that we hadn’t enjoyed our free room at the Garden Court yet. So, we decided to take a break this past weekend and enjoy our raffle win. We had a true blast. They upgraded us to a top floor suite. The room had a skylight, separate living room and bedroom, balcony, and large bathroom with separate shower and tub with jets. The hotel has been renovated in recent years and I highly recommend checking it out. We truly enjoyed our time into downtown Palo Alto, and had fun times at some old favorites including Il Fornaio restaurant and Acquarius Theatre. I never expect to win anything in these charity raffles, the fun is truly in giving back and helping others. However, I always seem to find that the more I give, the more I get back! I wanted to take this opportunity to also give a shout out to my good friend Marc Poirier, Co-Founder and EVP of Business Development at Acquisio. I try to surround myself with others who are values-driven business leaders. Marc is truly that. Despite being one of the most influential and busy leaders in our industry, he always makes time for others. One recent example: Marc is raising money for the Make A Wish Foundation, via biking in the 48-hour Ride For Wishes. I am incredibly impressed, and I was sure to donate in sponsorship of Marc. Just one more reason to check out Acquisio, in addition to their amazing technology, their culture is one of helping others and giving back. I also wanted to take a moment to call out my good friend Steve Kroll, President of Rocket Clicks, another values-driven business leader. Steve is someone who had done incredible things with his career, and always looks for ways to grow his team. I typically find that those who help others go incredibly far in life and business. If you’re looking for a digital marketing agency, make sure to check out Rocket Clicks! Do you enjoy helping others and supporting charities? Make sure to give back each and every day, it’s truly an honor and privilege!